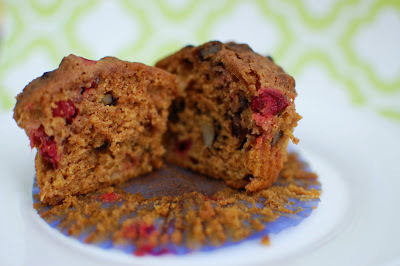 When I gave Hubby one of these muffins to try, he first thought it was a repeat of the pumpkin cranberry muffin. When I told him it was a new recipe, he seemed apprehensive. But I can say without any hesitation that these are much better (in my opinion) than the pumpkin ones of a few weeks ago. These muffins add a few extra flavors and textures. 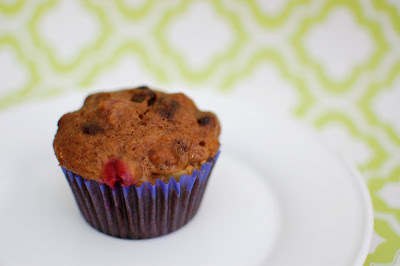 I love the different textures from the apples, cranberries, and nuts in the muffins. And they’re quite colorful! I ended up using walnuts and pecans because that is what I had on hand. This is the type of recipe that you can adapt to fit your pantry. I used Granny Smith apples and next time I’ll be sure to chop them a bit smaller. 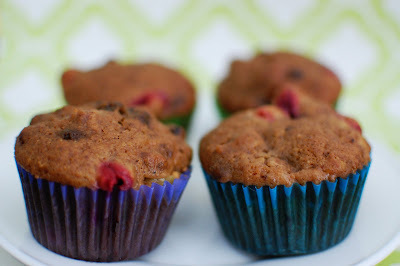 I really enjoyed the bites with the fresh cranberries in them. The small punch of tartness is just great. As always, I doubled the recipe so that I would have muffins to freeze for us. Preheat oven to 350 degrees. Prepare muffin pans. 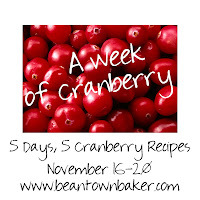 In large bowl, combine flour, cinnamon, nutmeg, baking soda, salt and whisk to combine. In another large bowl, combine sugar, pumpkin, eggs, oil, applesauce, milk, vanilla and stir to combine well. Add dry ingredients to wet ingredients and stir until just barely blended. Fold in apples, cranberries and pecans. Spoon batter into prepared pan. Bake for ~30 minutes or until wooden pick inserted into center comes out clean. Remove from oven and let cool in pan for 10 minutes. What a fun contribution to a virtual bridal shower. What girl doesn’t like cupcakes? Love that they’re filled too. Fantastic!